Skydive Las Vegas’ six-year battle with the Boulder City Airport ended in April when the business was deemed a low-risk operation by the Federal Aviation Administration. 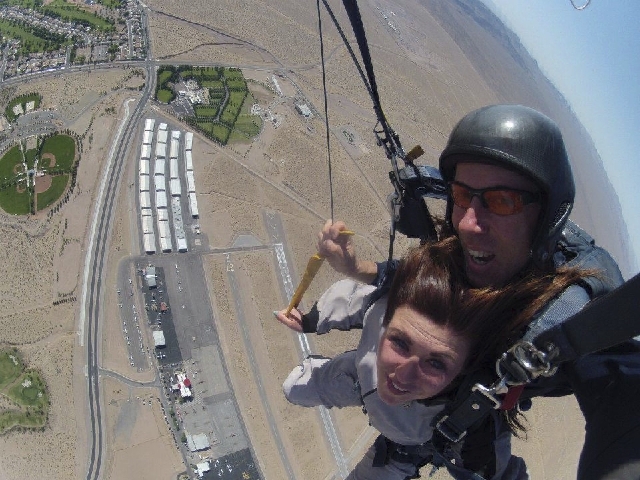 But another battle lingers for Skydive Las Vegas owner Brent Bruckner. At a City Council meeting June 25, Boulder City Municipal Airport manager Kerry Ahearn announced the FAA’s finding about the safety of Skydive Las Vegas’ operations. Buckner expressed satisfaction with the ruling. Inspectors pointed to two items that were necessary for a safe sky dive operation. First, the airport website had to have a written procedure on parachute operations; such a procedure was implemented in February. Second, Skydive Las Vegas had to find a way to mitigate the daytime helicopter traffic at the airport. Several methods in place appeased the inspectors including constant communication between Skydive Las Vegas’ airplanes and the helicopters. The helicopters all depart at the same time and their normal flight paths don’t usually conflict with Skydive Las Vegas’ operations. The most recent FAA inspection was completed in November. A letter was sent to the city stating its findings in April. But Buckner’s conflict isn’t over. He must now negotiate prices on land that he leases from the city for his drop zone. His most recent lease, negotiated in 2001, was re-signed every two years by the city, charging Buckner for 150-by-150-foot space. But the city terminated Bruckner’s lease in 2011, saying he’s using more land than he is being charged for. The city opened negotiations on a new lease in early 2011, but Buckner did not respond for several months. When Buckner did respond, he was not agreeable to all the new terms. With the city threatening to shut him down, Buckner agreed to negotiate. Buckner’s safety issues began in 2007 when the first round of inspections — a ramp safety inspection — was completed by the FAA and showed increasing risk for a serious accident scenario. City officials said they had to act on the findings because it involved safety issues at the airport. “The FAA’s findings that an increasing risk for a serious accident scenario was not something the city could simply ignore,” Ahearn said. The 2007 inspection report warned that diver safety was at risk because of already increased traffic and the possibility that growth would make traffic even more chaotic. With no serious accidents on record at the time, the report’s remedy was to move the drop zone off-property, something the most recent inspection has nixed. Bruckner says air traffic runs smoothly at the Boulder City Airport although the airport lacks a radio tower. Traffic patterns also contribute to the smooth operation, Bruckner said. Each aircraft flies at a different level over the airport — helicopters fly at 500 feet, small airplanes fly at 1,000 feet and some larger planes fly at 1,500 feet. “We have a protocol in place that parachutes will never deploy under 2,000 feet so they should never conflict,” Bruckner said. “If the helicopters are flying where they are supposed to be, and the parachutes are flying where they are supposed to be, they should never interfere with each other,” Buckner said. City officials are no longer concerned that Buckner’s practices are unsafe but are concerned over a long-term lease agreement for his drop zone. The two parties will come together soon and airport officials are optimistic that a deal’s within reach. “The city feels a fair agreement has been reached and expects Skydive Las Vegas to sign the access agreement shortly,” Ahearn said. However, the new agreement between the city and Skydive Las Vegas was pulled from Tuesday’s City Council agenda.